This unique design by Hector Aguilar was executed at his Taxco shop, Taller Borda. It has a wearable length of 6 1/4" with a 1" gap opening and is 1 3/4" long at it's widest point. It has bold X and O cutwork design across the front and flairs to a scrollwork design on the ends. 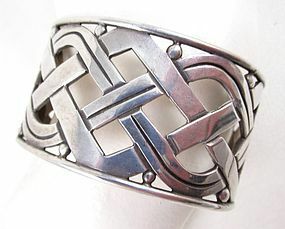 It is in excellent condition and is hallmarked "Taller Borda 925 Sterling Mexico" on the inner cuff.